I am so excited to share this with you! On April 2-3, I get to travel to Atlanta to attend the 2016 Gluten Free & Allergy Expo! Just imagine! The biggest gluten free and allergy friendly event in the United States, and I get to be there. To be invited to such an event is definitely a highlight for me. I live Gluten Free and cannot wait to return with awesome products to share with you. Living the Gluten Free lifestyle isn't always a choice for everyone. Health reasons have lead me on this journey. 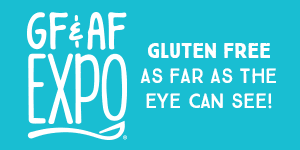 With events like the GF & AF Expo, finding the right products to stay healthy and Gluten Free, is just that much easier! Be sure to follow me on Instagram to see all the fun and noteworthy products I'll be testing out. Follow along with the expo in Atlanta as well as the other 6 cities by following them on social media! Want to be there right with me? I am giving away a few tickets!! Good Luck! Disclosure: Sweet Cheeks Adventures teamed up with the Gluten Free & Allergy Free Expo for this giveaway. Other participating bloggers are not responsible for choosing the winner or shipment of product. They have not receive any compensation for this post. This giveaway is in no way associated with Facebook, Twitter, or Pinterest. The winner will be chose at random by the Giveaway Tool and emailed. The winner must claim the prize within 48 hours or they risk forfeiting the prize.